I know it has been a lot since my last post and I am sorry not to have posted anything. A lot of things happened in the last month, of course if you follow me on Instagram you may know yet that I have been in Milan for Lana del Rey's concert. 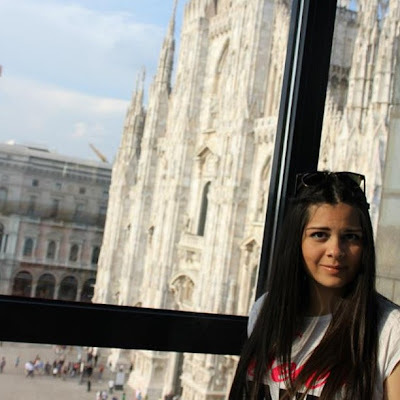 I didn't know that Milan was so amazing, it was a complete surprise to me! If you normally ask me which Italian city is my favorite one I say Rome. I still love Rome, but, after this experience, I'd say that Milan is more my cup of tea. I love hystoric cities, but I especially appreciate cities that offer a lot of opportunies. And Milan does that, it is full of events, concerts, galleries, like there's always something to do! Also, I was impressed by the class and the style of Milan inhabitants. You always see them wearing elegant clothes, something that, I have to say, made me feel inappropriate sometimes (like in Marc Jacobs where I was wearing a pair of shorts and a t-shirt!) . Of course you need financial sources to attend every single classy event in the city, but it is not all about money! ps. I changed the header, and I am planning to change it again. Thanks Genny Tutino for the graphics! Also, are you following me on Instagram yet?